By at least one measure, these countries rank worst in the world, according to the International Monetary Fund's estimates. 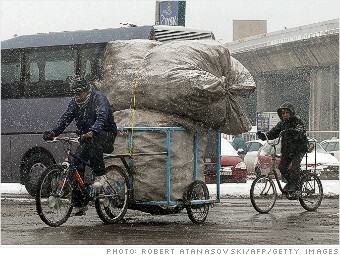 People ride bicycles during a snowstorm in downtown Skopje. The IMF does not publish unemployment statistics for every country -- but of those listed, Macedonia has the highest rate. In 2012, unemployment is projected to top 31.2%. The rate has been stubbornly high for years despite solid if not spectacular economic growth, suggesting that structural problems are to blame. Observers frequently note that official unemployment statistics do not include the country's so-called gray market, which is thought to make up a significant portion of Macedonia's total economic activity.